The Great Sand Dunes National Park is one of the lesser-known national parks in the Southwestern US. I have been photographing there since the late 1980s. 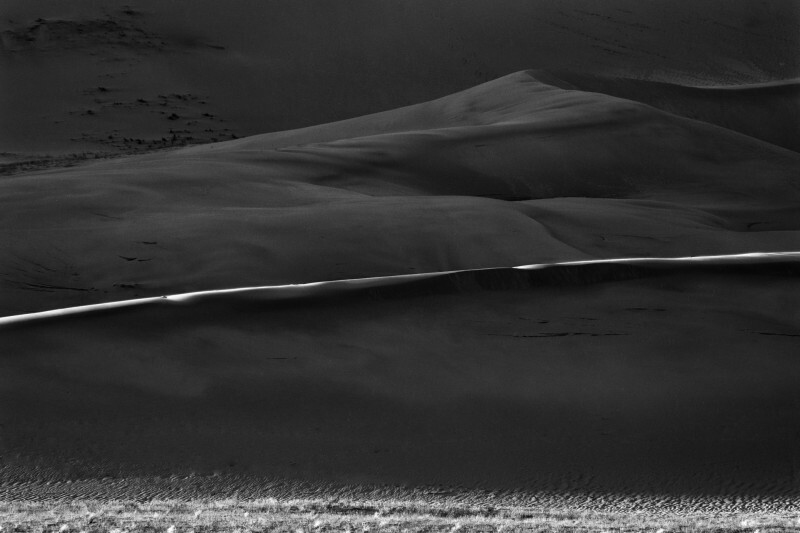 The dunes provide an endless source of inspiration and emotion with their ever-changing shapes and moods. Covering over 35 square miles, they are nestled against the San Juan mountains in south central Colorado. The magic of the light in the morning as it first tops the mountains to the east provides a brief window of time to capture the light playing along the ridgelines of the dunes. I find this time the most rewarding photographically. I have spent 35 years in photography; the last 25 as co-owner of Crick Camera Shop in Kansas City, MO. My main photographic interest is in the American Southwest, photographing the landscape and the ancient Indian ruins. I also teach digital photography at the Kansas City Art Institute, teaching both Intro to Digital SLR and Advanced Digital SLR for the past seven years. My work has been shown in several group exhibits, including the Leica Insight group show in Bejing, China, as well as images held in private collections.